Oxford University Press, 2002. - 378 с. Description: A clear, accessible dictionary to help students with this essential aspect of English. The dictionary gives students the information they need both to understand and to make active use of nearly 6,000 common British and American phrasal verbs. The exceptionally clear design of the dictionary makes it very easy to use. 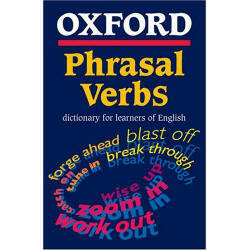 The main section of each entry contains a clear definition of the meaning of each phrasal verb. A defining vocabulary of less than 3,000 words keeps the definitions simple and easy to understand. Corpus-based examples show how phrasal verbs are used in current English. These provide useful models to follow. The entries include related nouns, adjectives, and idioms which are derived from the phrasal verb (such as the noun 'break-up' from the verb 'to break up'). Stress is shown on each phrasal verb to encourage correct pronunciation. Usage notes dealing with common problems help learners avoid typical mistakes. Full information is given on the grammatical pattern of each phrasal verb. Common subject and object collocates used with the verb are included. Students can draw on these for their own active use. Synonyms and opposites are given to help learners build their vocabulary. The dictionary contains study pages which give students further guidance on learning and using phrasal verbs, and photocopiable exercises which can be used for classroom or individual practice. At the back of the dictionary is an invaluable guide to the meaning of the adverbs and prepositions which are used to form phrasal verbs.